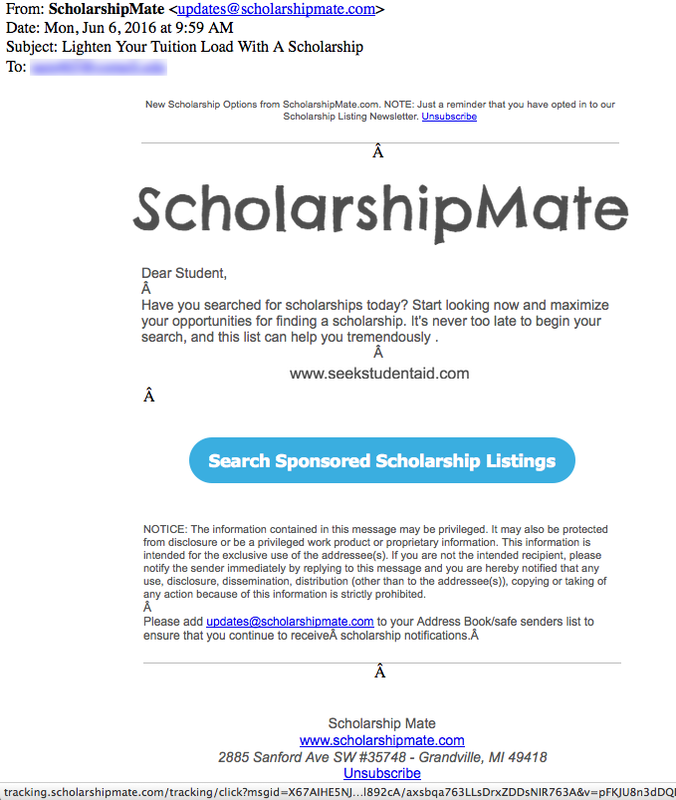 The Daily Scam | Scholarship Scams? You Be the Judge! Scholarship Scams? You Be the Judge! You are here: Home » Scholarship Scams? You Be the Judge! We see a lot of highly questionable pitches for student or career-change scholarships and financial aid services. We also see scholarship and aid offers that are obviously poisonous. Can you spot the obvious scams from the highly questionable? We’ll show you our recent collection and you can draw your own conclusions. PS. We would like to thank the Cornell students who sent us some of the emails used in our article. If you think you’ve received some questionable or scam pitches for scholarships and financial aid, send them to us! spoofs@thedailyscam.com. We also found this complaint on Yahoo from someone calling these emails spam and identifying other domain names as well. 4. Finally, the biggest nail in this coffin is what we learned after submitting the full link found in the email to the Zulu URL Risk Analyzer. Though Zulu scored the link as “benign” with 29 out of 100 possible points (Zulu isn’t perfect but it is good) look carefully at the screenshot. Zulu informs us that the website is hosted in Bulgaria. Do these attributes inspire confidence in turning over a great deal of personal information in your scholarship application? 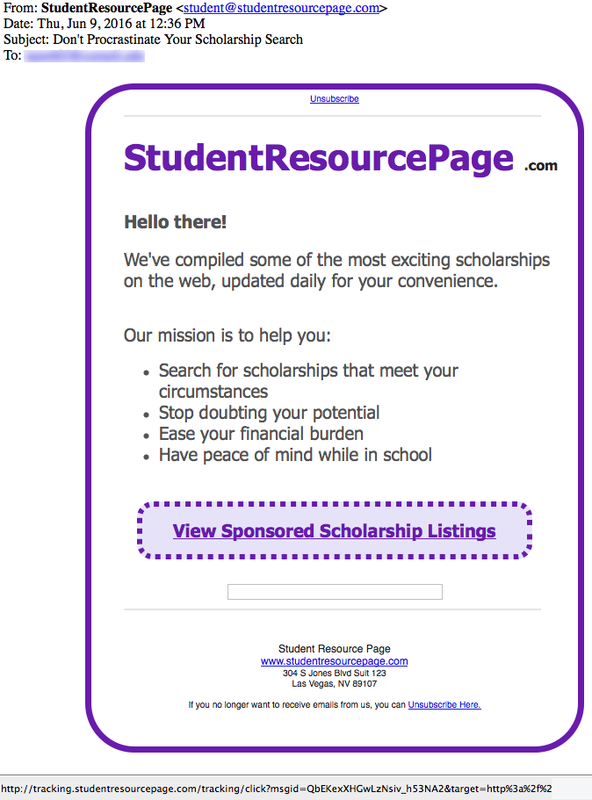 In early June a student received this email from updates@scholarshipmate.com with the subject line “Lighten Your Tuition Load With A Scholarship.” “Dear Student, Have you searched for scholarships today? Start looking now and maximize your opportunities for finding a scholarship…” A mouse-over of the link shows that it points to the domain (with subdomain “tracking”) tracking.scholarshipmate.com. So what do you think? Legit? Afterall, the fine print says “Just a reminder that you have opted in to our Scholarship Listing Newsletter.” And if they said you opted in, it must be true, right? 1. 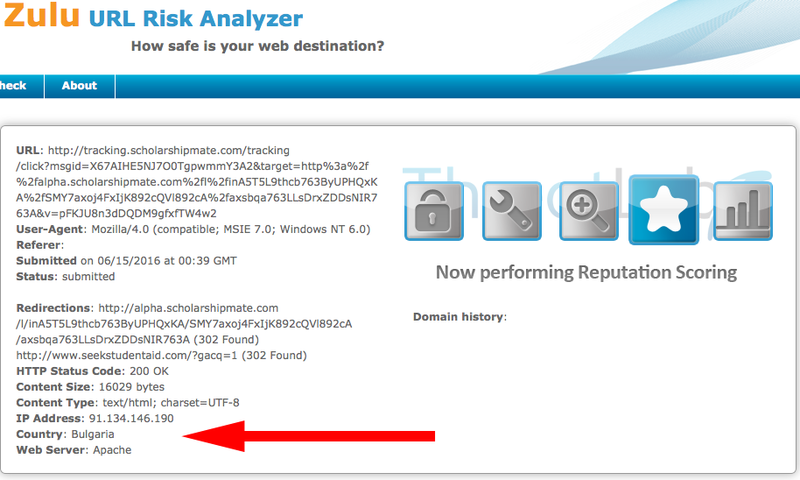 The link in the Scholarshipmate.com email you are meant to click is coded very uniquely to include a redirects to subdomains “tracking” and “alpha.” This is EXACTLY like the first scam above. This is not a coincidence. 2. The domain was registered on November 11, 2015 through the same WHOISGuard privacy service in Panama. There IS a website at this domain Scholarshipmate.com but I wouldn’t visit it with a 100 foot pole! 3. The email is coded/constructed the same as the first email from StudentResourcePage.com even though the domain is different and even though the second email identifies itself with an address in Grandville, MI. Funny thing about emails that list an address in Grandville, MI… We found an article by Garret Ellison of the local Michigan news company, Mlive.com, about the misuse of this address. Read through the initial scam topic of their news story and then see the comment from the Better Business Bureau. #35748 appears to be little more than a mailbox drop. Apparently, many others have complained for years about spam scams being associated with this Michigan address, including this August, 2011 post from an Anti-spam blog called blog.onlymyemail.com, this personal blog post from February, 2012 and this Apple Discussion about spam in July, 2013. 6. Like the first domain, Zulu finds that this domain is associated with Bulgaria. 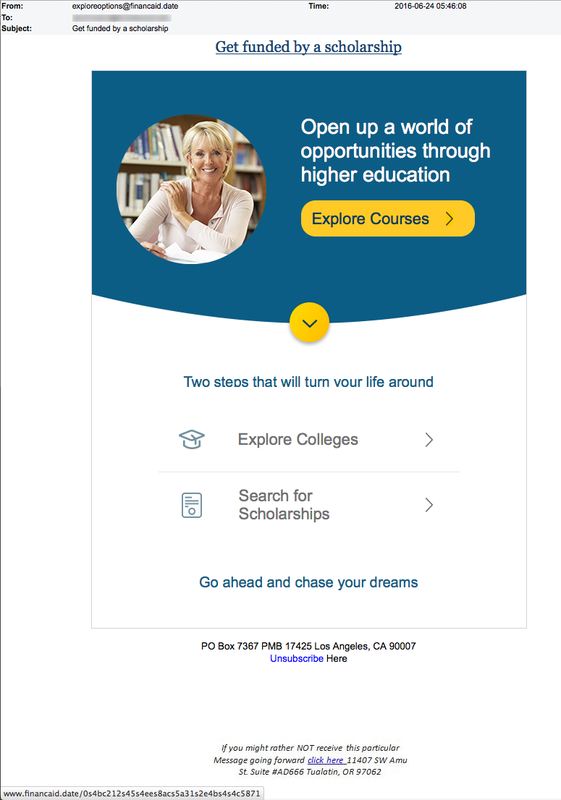 Finally is this email from exploreoptions@financaid.date with the subject line “Get funded by a scholarship.” “Open up a world of opportunities through higher education. Explore Courses…” Does this feel legit to you? Let’s start with the strange domain FinancAid.date. According to a WHOIS look up (http://whois.domaintools.com/financaid.date) the domain FinancAid.date was registered by someone named Ajit Tamraker on June 24, the day the email was sent. 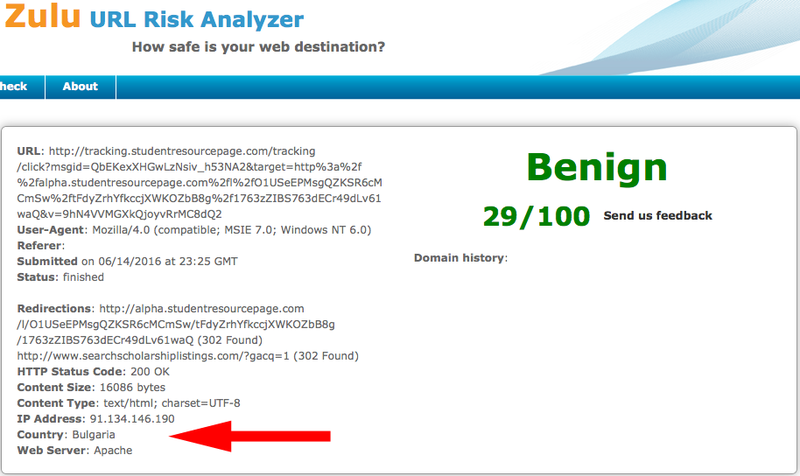 And the domain is being hosted on a server in Picassent, Spain. As you might expect, Google can’t find a thing about this domain.